I don’t know what it is about my book club picks this year. They seem to be taking a religious, emotional turn at full speed around a curve with no side rail. Perhaps it’s because of the difficult times we are facing. Perhaps people are drawn to inspirational tales of overcoming obstacles and wanting to discuss them in an open forum. So far, 3 of the last 5 books we’ve read have dealt with death on some level and it’s not even Halloween yet. Not Sherlock Holmes solving a mystery type of death, but long drawn out, miserable suffering sort of death. Do I want to read about this stuff in a time of crisis? In the words of Charlie Brown, good grief, no, no, no. Not one right after the other. I’m starting to have nightmares. Seriously. 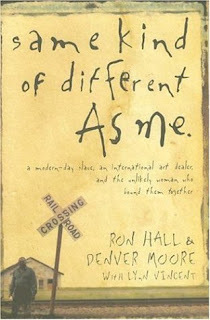 With that said, if you’re still even reading this depressing ink (if I were you I’d have stopped long ago) my third tale of woe in this series of “inspirational” reading, is one of Denver Moore, a man born and raised in Louisiana in the 40’s and 50’s, and until the late 60’s worked for “the man” on a share-cropping farm. He’s never been to school a day in his life. Never gotten a birthday present. Never owned a home or a car. He’s a man who’s skimmed along the surface of life without anyone noticing. Until he meets Ron Hall and his wife Debra at a homeless shelter, two rich people trying to make a difference. They notice him, and everything changes for all three of them. If this book had only been about Denver, I probably would give it 4 stars. His story was very interesting and almost unbelievable. A modern day slave on a cotton farm, he worked for nothing but food and a roof over his head until he literally jumped on a train to Texas, and while there remained homeless for almost thirty years. Somehow what he said rang true. However, Ron Hall’s part of the story (as it is told from both their perspectives) I found to be self-indulgent and (here’s that dreaded word again) preachy. He talks of his “poor” beginnings in a white middle class family. How he smoked pot with “fat chicks” in college and how later he rose from Campbell Soup salesman to a fantastic and super rich art dealer of the famous. Somewhere along the way with the help of his saintly wife, and after he’s caught having an affair, he finds God and a purpose in life. His wife drags him to a homeless shelter where the two of them come across Denver, who is of course all too happy to be hounded by two rich people with a cause. It’s not hard to guess what happens next. let's see if i've grasped this. "Ugh" sounds just about right, Lula. I often feel my life is boring which is why I feel the need to write. My characters can live the life I can't or am not too daring to live. I get preached enough at home, why would I turn to a form of escapism to take me right back to where I came from? Exactly. By the end I wanted to poke my eyes out.